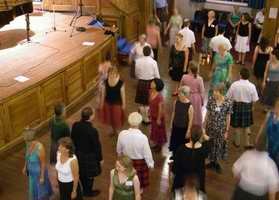 Over the years 2005-2007, several people from our local Essex Scottish country dancing clubs have disappeared during the summer to go to the annual St Andrews Scottish Country dancing summer school organised by the Royal Scottish country Dancing Society (RSCDS). I was persuaded to go this year. We selected the first of four similar weeks and I entered myself for the introductory level class. 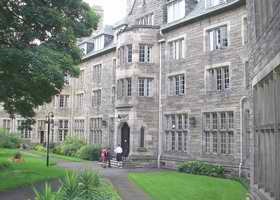 The accommodation was based on the University of St Andrews and in this case our rooms were in the impressive grey stone built St Salvators Hall, shown in the picture on the left, together its the associated splendid dining hall, with oak panelled walls, stained glass windows and long wooden tables. 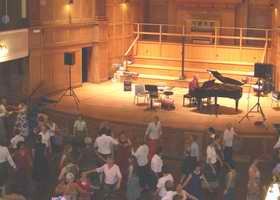 Some dances were accommodated elsewhere at New Hall, a more modern three star place with en-suite facilities, plus bar and dining room. 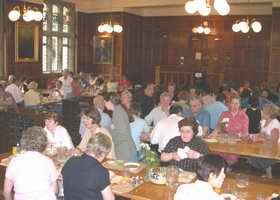 We had no bar but a large grand coffee lounge where sit is comfortable chairs and we could chat after meals. The summer school office and shop were on the ground floor. 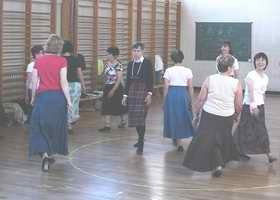 We had two dancing lessons every morning, walk through sessions in the afternoon and proper social or ceilidh dances in the evening. 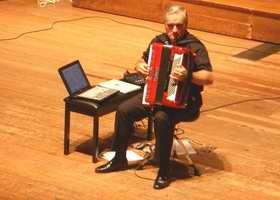 We had live music at every session. 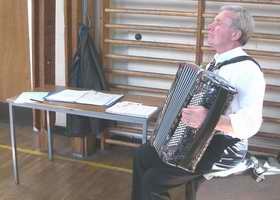 Musicians are very welcome and some attend during weeks 2 and 3 for musicians courses. Advanced dancers come to improve their proficiency and get teaching certificates to teach and lead dances back home at their local clubs. In this way there is some standardisation and people all over the world get to know what they are aiming to do. I was a bit worried at first that everyone would take it all very seriously but was quickly put at ease by our instructor who put a lot of emphasis on us smiling at each other, taking time to talk in the breaks and enjoying ourselves. 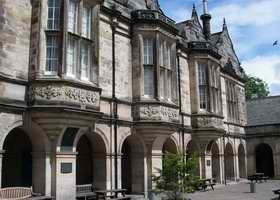 My class was held in the Madras College building about half a mile from St Salvators. 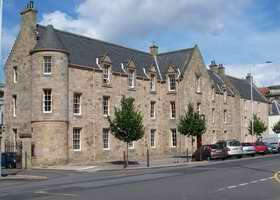 It was a nice short walk crossing the wide cobbled market street that runs down the centre of St Andrews. There are loads of small shops, coffee bars, pavement cafes and the place was busy with sea side holiday makers, golfers and us dancers. It is not a place where you feel out of place wearing a kilt. In the case of the dancers - all of the men wear kilts ! 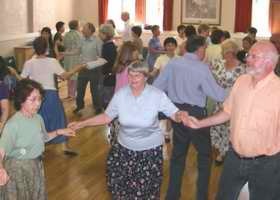 One afternoon we made the Victory Memorial Hall open to the general public and passing holiday makers for a Scottish Country Dancing Taster session so anyone could come in and have a go. Astonishingly the place was full after the first few minutes and everyone had a lot of fun that afternoon. During the morning break between classes we wandered off to various places for coffee. 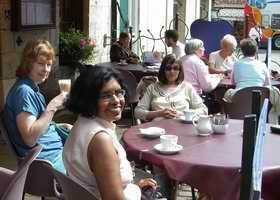 The best place we found for coffee was the Doll's House Restaurant at 3 Church Square, St Andrews. We had 3 days of instruction from Moira Stacy and 3 days of instruction from Ruby Wilkinson. Our music man all week was Frank Thompson. Dress code: Men: Kilt and plain shirts. Ladies: Skirt or Dress. The summer school is all run by volunteers and our thanks go to all who help organise and help with the music and teaching. "I particularly enjoyed meeting up with old friends, making new friends. 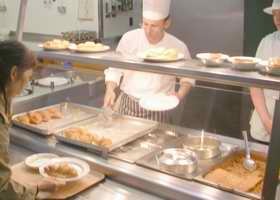 The live music at every lesson was great and the food excellent." For more information and to book for future years email info@rscds.org at their office in Edinburgh at 12 Coates Crescent, Edinburgh, EH3 7AF, Scotland. 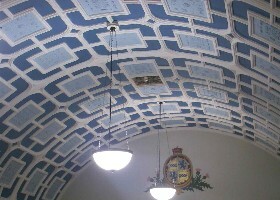 Page started 2007. Last amended 2 August 2015, 30 May 2019.